Reel Repair – The Reel Dr – Your Western Canada Warranty Center and Parts Supplier! Is your fishing reel giving you problems? Not too sure how to install that part? Want it to look and feel like it did 40 years ago? No problem! 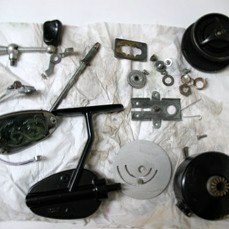 Send your fishing reel into our service technicians here at Reeldr.com for a complete service & restoration! Cleaning & Servicing your reel consists of taking apart the reel and manually cleaning all dirt, mud and sand from each piece. The reels are inspected for any flaws, and then while re-assembling the reel back together, we apply Quantum Hot Sauce to all moving parts. Cleaning is done to both the interior and exterior of the reel! 2. Include a note with all of your contact information (name, mailing address, email address, phone number…etc). On the note, describe in as much detail as possible what the reels in for. On the outside of the box clearly mark “REELS TO BE REPAIRED AND RETURNED TO USA (or whatever country you are from)!” in AT LEAST THREE SPOTS! 4. Take the package to your local post office to ship. DO NOT SHIP THROUGH UPS OR FEDEX!! Any packages sent this method will be returned unless prior arrangements have been made. The reason for this is that both UPS and Fedex charge $40+ in customs fees for any package to cross the border. Please ship through the United States Postal Service or Canada Post ONLY. We also recommend that you add tracking and insurance to the package. 6. You will be notified by email once the package arrives if you request that service. 7. Once the reel(s) have been serviced, we will contact you via phone for payment. Payment can be made by Visa/Mastercard over the phone, PayPal (secure online credit card payments), or by International Money Order. If you have any addition questions/concerns, please contact us! * Service price of $28.95 – $38.95 does not include cost of any replacement parts or shipping! Reels with excessive salt damage will have a slight additional charge.